As we put 2016 in the History Books. I just want to say I am very thankful for the progress we have made as a Church at NGCC. Yes we still have a long way to go on this journey to be The Light of the World: A City Set on a Hill. I truly believe Jesus is smiling down on His Church . We have made a commitment to live by the Great Commandment by Loving God and Loving People and following Jesus in His call for His Church to live out the Great Commission! It is evident from everyone that comes through these doors that we are in Love with Jesus. I see us as a Church that has a Great Spirit and determination to serve our Community and reach them for Jesus. As your Pastor I am Blessed and very excited to have this opportunity to lead this church to be an Acts 2 Church. Thank you all for your service to King Jesus. We have some very exciting days ahead as we look to see where Jesus is working and follow Him whenever and wherever He calls. Let’s finish this year strong in His Mighty Power. We stand in awe of what Jesus is doing in His Church…Jesus truly is building His Church His Way! Well, what has occurred in my world? We have started a new Sunday morning Bible Study for our 18-25 year olds. I call it “The Bridge Group”. This class will explore Biblical implications of this age groups concerns. Some of the topics we will discuss are the Paranormal, the End Times, Pre-Marital Relationships and Friendships to start. We have already had some very interesting discussion on the paranormal, very cool. I am also, on request of Pastor Paul, reviewing the 201 curriculum and trying to “make it flow” and applicable to our church body. Finally, as the Marine commercial states “we are looking for a few good men”…Your Discipleship Director is looking for a few good houses. With the new year around the corner, we want to start it out right with a couple of home study start-ups. As Pastor Paul has stated on numerous occasions, we want the whole church involved in some sort of service area. What a great opportunity to dig deeper into those Biblical issues that concern us than in a more intimate setting as a small group. If you are interested in opening your home for one of these studies or have an interest in leading a study, please see me. God is moving among us and what a wonderful thing it is. I enjoy seeing the growth and excitement amongst us all! In October, Pastor Eric started children’s entertainment upstairs providing snacks, watching movies, hearing a Bible story, and playing games as the adults are able to enjoy the music downstairs. If anyone is interested in being a helper, please see Pastor Eric as I believe this ministry will grow. Below are the remaining two events of the year. On November 19th, with doors opening at 7pm for a time of fellowship and concert from 8-10pm, the night will be filled with worship from the Tuesday Night Live (TNL) Praise Band. 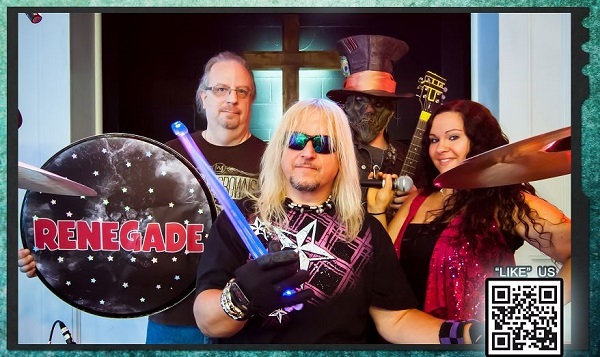 This band is from Southern MD and formed at a young adult’s Bible Study led by Pastor Marvin Harris with one of their sound men being our own Keith Myers. Bill and Julie Drenning met at the study and are celebrating their 23rd anniversary this month which is also the number of years when we started the coffee house. Sign-up sheet of the food needed to share will be posted to the church bulletin board. You can also message the ministry leader if you would like to bring a certain item. This month’s needs are: hot dog buns, fruit or veggie tray, case of water, variety bag of chips, and desserts. You may also bring a pot luck. On December 17th, we will be celebrating the Christmas season with HMS Renegade whose members you will recognize from the church praise team. You may have seen the band also perform at the opening celebration of the lighting of the Christmas tree in the middle of Glen Burnie. A sign-up sheet of the food needed to share will be posted to the church bulletin board. Hard to believe another year will soon be over. 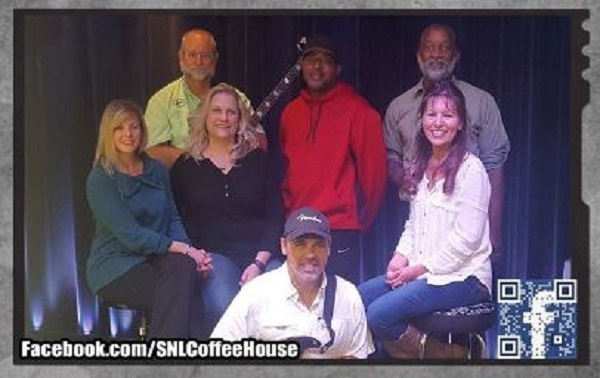 Visit the coffee house Facebook page at SNLCoffeeHouse for previous pictures of the bands and to also help us promote the events. December is going to be a great time for our church family! We want to reach out to our community with the love of Jesus! December 4th after service – Please join us as we gather together for a time and of food and fellowship! Each family that plans to attend is asked to bring a dish to share. Do you access our website through your smart phone or tablet? You’ll find that we’ve made some changes to our home page to make it easier to access key resources on mobile devices. We’ve slimmed down the page to show the key items you’ll need when accessing the page on mobile. You’ll find our Mission Statement (for new visitors), the upcoming Sermon topic, a handy link for Online giving, a link to our Sermon Archive on the site, and a quick look at Upcoming Events from our Church Calendar. We also have the recent Blog posts, and links to connect with us on Facebook, via our Blog posts, and our newsletter. Let us know what you think, and if you have ideas for further improvements! Contact us via the online site form, or through Facebook. So hard to believe we are closing out another year very soon! On behalf of our children I thank God that He heard our prayers on Election Day! Our children come up against so much more than we ever did growing up. We need to be in constant prayer for them! The children are learning two songs our Christmas Eve service. They are Christmas Medley by Hanson and Jesus, Born on This Day. We are going to pre-record as many families do travel and we want to make sure all the kids get to participate. Please see Kim Gayleard with questions or if you do not want your child to participate. As always we could use help!!!! Let me know if this is you! December 12th- Santa in Our Community – see more below in Outreach Opportunities. December 18th after service – Children’s Christmas Party! All are welcome but must RSVP to me. December 24th- Praise and Pajamas! Children of all ages are invited to wear their Christmas pajamas! After Praise and Worship the children will be dismissed to have cookies and hot chocolate and hear a special story. The adult classroom and prayer room are now finished as well as the new kitchen in the downstairs greeting area! A new nursery floor will be installed soon. Anyone looking to help with painting, hanging blinds, washing and hanging the greeting and worship area curtains or general repairs are always appreciated. December 12th We are going to get Santa to come down to visit our community! What a cool outreach! We need volunteers to come along to pass out invites to our Christmas activities and candy canes to the children! We will have a sign up. Time TBA. Our next outreach is on December 3rd at 10:00 and lasts until 12:00. We appreciate those who have supported the coffee house over the past 23 years. Even those who do not attend North Glen can serve in this ministry because of their love of music and others. We need volunteers to help serve food and prepare the church for the next day. If you are unable to come the third Saturday of each month, tables and chairs are arranged the Wed before the event after Bible Study.